'Sunday lunchtime was always the worst. Vicki planned to spend her summer as a waitress in her father's seaside restaurant, a must-see tourist destination w/ its seashell-covered walls, a 230-year-old portrait of an evil eyed sea Captain & the majestic figurehead from his ship. But when the bay went dry & a 1772 sailing ship appeared, Vicki's course was reset. For where the greedy mayor saw dollars signs & a nosy reporter saw something fishy, Vicki saw ghosts. Determined to discover the truth & to uncover old family secrets, Vicki, along with her new best friend Peter, must venture into the deep & believe the unbelievable. Two things attracted me to this book when I saw it. 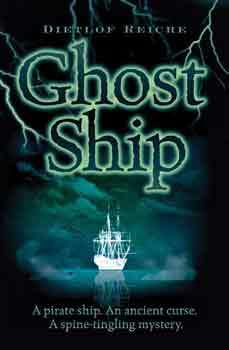 Firstly the cover, it just looks so ghostly and chilling, I couldn't resist. Secondly, the idea of a bay drying up and an eighteenth century ship appearing adrift in the bay. What a fabulously original story line. I was completely intrigued by this book and couldn't wait to read it. I actually took this one on holiday with me, as it appealed to my holiday mood - set in a seaside tourist area revolving around tales from the past. I have to be honest and say their were some things that were too obvious in the plot line. The occasional event occurred that were just to easy to predict. Although on the whole I was urged on to read to find out the ending. In some scenes, I would have also liked more action, but that is just my personal preference. I really liked Vicki and Peter, the two main characters within the book. Vicki seemed to get away with murder as her parents were so busy with their restaurant, so she seemed to have a lot more freedom of a twelve year old than I would have expected. There are some dark and chilling scenes within the book which I really enjoyed. To me, this was a good old fashioned mystery story with a modern setting. Give me a mystery and a curse and I am a happy girl. If you liked the ' Secret Series' by Enid Blyton or you have read and enjoyed the more modern equivalent,' The Adventure Island' series by Helen Moss, then I think you might enjoy this one. It is very rare to read a German author, in fact the only other German author I have read is Cornela Funke who also is published by Chicken House. I love that Chicken House embrace all nationalities providing us with a wider range of fiction. That is indeed a great cover, and this sounds like a perfect read for this time of year. You're right, it's a shame that you don't find more children's and YA fiction in translation. I'm glad that at least one publisher is addressing that. I can see why the cover captured your interest, it has that eerie and wonderful feel to it. I'm sorry that it didn't live up to your expectations. I would recommend Kerstin Gier's Ruby Red(first in a trilogy) as another story by a German author. It's a time travel/mystery YA novel with a tiny dash of romance in it. A cute, fast paced story. Nymeth - it was something a bit different. Chicken House seem to be very good at publishing translations. Mari - I shall write that one down and see if we can get it over here. You can't love every book though. Glad you mentioned Enid Blyton as the cover of this put me in mind of her books. I love the sound of this one Viv! Ill have to add it to the wishlist! I agree, great cover. It really caught my attention too. The story sounds good as well so yet another one for the wishlist. Petty Witter - I was a huge fan of Enid Blyton, so this really appealed to me. Raimy - it is on my ReaditSwapit list if you want to swap. Darlene - really not helping you am I! Carmen - I am a sucker for a cover! That is a great cover. I think I'd like this one.